In a week during which I tasted most of the reference point Sangioveses and Sangiovese-based reds, one wine stuck out – Le Pergole Torte. Quite honestly, I had a hard time getting to sleep the night I tasted these wines. They were that viscerally thrilling. Le Pergole Torte isn’t a great Tuscan or Italian wine. It is simply one of the world’s elite wines. 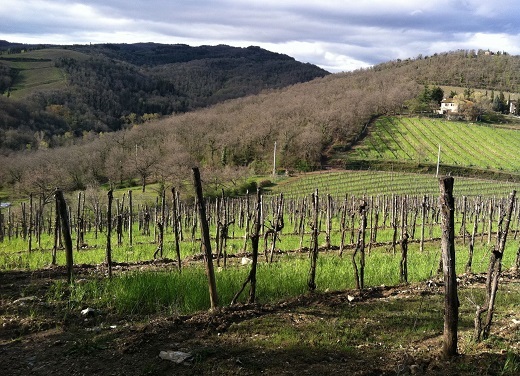 Montevertine is located in Radda, one of the coolest, highest-altitude spots in Chianti Classico. When I visited last April, the vineyards were noticeably more backward in their development relative to what I had seen in the other parts of the region. Le Pergole Torte was a groundbreaking wine when proprietor Sergio Manetti first conceived it in the early 1970s. At the time, Chianti Classico regulations obligated producers to include white grapes in their wines. Manetti dreamt of something else, a wine that would explore the greatness of Sangiovese. Along with noted oenologist Giulio Gambelli, Manetti created Le Pergole Torte, one of the first 100% Sangioveses made in Chianti Classico. Because it was made outside of appellation laws, the wine carried the humblest of all designations, ‘Vino da Tavola’ But the wine itself was fabulous, and the public soon caught on. In 1990 Manetti bottled a wine that would become an icon, the 1990 Riserva, which was an absurdity on paper, given the inherent contradiction of the terms ‘Vino da Tavola’ and ‘Riserva.’ To add to the irony, years later the Chianti Classico laws were updated. The obligatory use of complimentary white and red grapes was abolished, which meant Le Pergole Torte could be a Chianti Classico, but Manetti never returned to the appellation that had snubbed him. One of the misconceptions about Le Pergole Torte is that it is a single- vineyard wine. That was true of the early years up to the late 1980s. By 1990 Pergole Torte had become a selection of the estate’s best fruit across several parcels, although it wasn’t until 2001 that the fruit was sourced from the same basic complement of vineyards that is used today. Sadly, Sergio Manetti passed away in 2000. Manetti’s son Martino took over and adds that he is fully responsible for every wine beginning with the 2001, where he personally made all the decisions. Le Pergole Torte is vinified in cement. The wine is aged for one year in French oak barrels followed by a second year in cask. Martino Manetti isn’t afraid to call them as he sees them. Manetti describes 1985 and 1997 – both heavily touted years – as overrated. 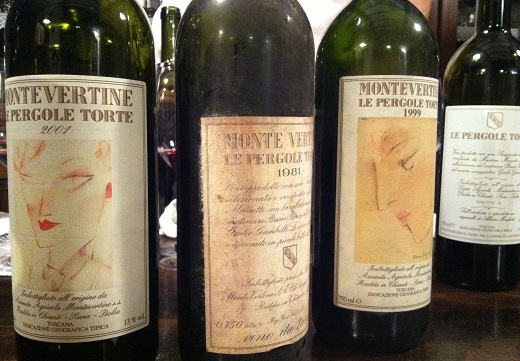 For this tasting, Manetti pulled a selection of vintages from his cellar, all based on their personal significance to him. For more on Montevertine, readers might enjoy taking a look at this video interview with Martino Manetti.